Yesterday saw another huge sell-off for oil markets, in conjunction with the largest single-day stock market drop (by points, not by percent) in history. In just two days, crude oil has fallen from $66 down to below $63.50 yesterday, a loss of 5%. Today, oil prices are struggling to recover ground lost overnight. Between yesterday’s closing price and today’s opening price, crude prices fell another 72 cents. 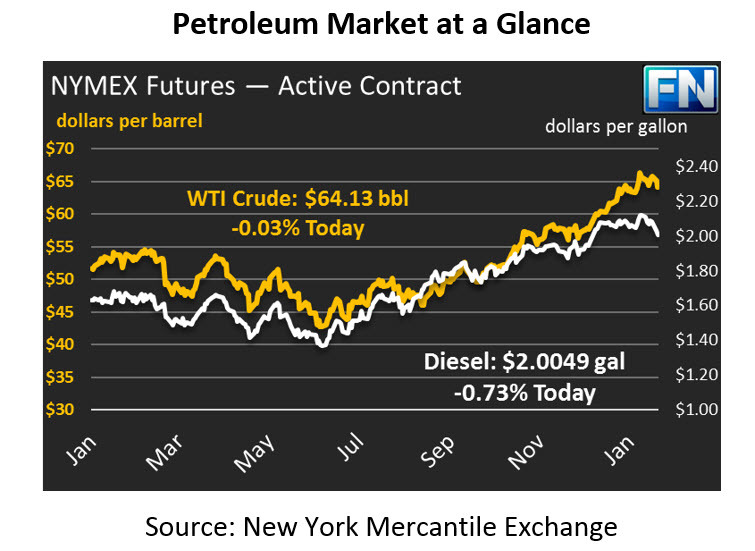 Markets have since caught up to yesterday’s closing price, and crude prices are currently trading flat at $64.13. Refined fuels are also struggling. Diesel prices have fallen 9 cents (-4.5%) while gasoline has fallen almost 8 cents (-4.2%). Unlike crude oil, both diesel and gasoline are trending lower this morning. Diesel prices are currently down 1.5 cents (-0.7%), trading at $2.0049. Gasoline is down even more, falling 2 cents (-1.1%) to trade at $1.8266. Yesterday’s significant stock market losses are sending ripples throughout financial markets. Ironically, strong economic growth is one of the likely culprits behind the sell-off. Rising growth rates will cause central banks to increase interest rates to moderate growth and prevent inflation. Rising interest rates would reduce corporate profits, while also leading investors to put money into bonds rather than the stock market. For oil markets, rising U.S. interest rates would strengthen the dollar, putting downward pressure on oil prices.